HOW TO MAKE: WATERMELON RICE KRISPIE TREATS! - What About Watermelon? You are here: Home / Recipes / HOW TO MAKE: WATERMELON RICE KRISPIE TREATS! I’m not much of a baker, unless you consider making tiny, quarter-sized cookies in my daughter’s Easy-Bake Oven “baking.” My wife, on the other hand, is the baker in our family (I do a lot of the other cooking, though!). She loves to bake cakes, pies, tarts and tortes (don’t ask me the difference between tarts and tortes). And, like the supporting husband I am, I sample every one of her creations with a smile and (mostly) honest feedback. So, you can imagine my excitement when I found a pseudo-baking recipe that I could actually do without setting off the smoke alarm. 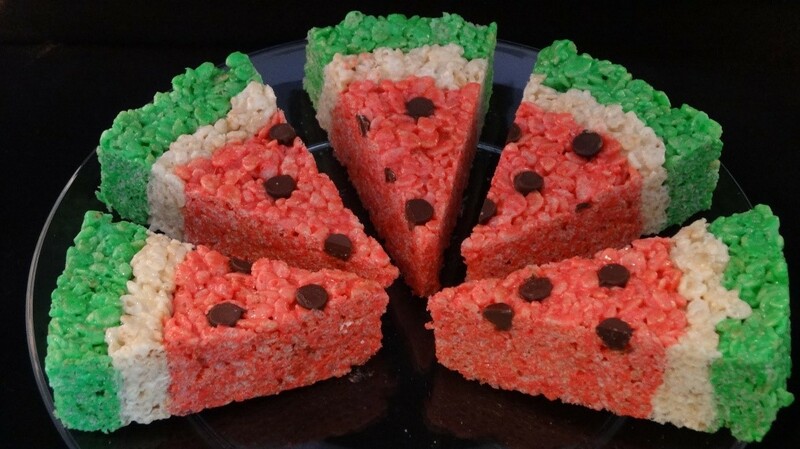 The Watermelon Rice Krispie Treats above are so realistic, you might think you’re actually eating a slice of watermelon. The best part? It’s so easy that almost anyone can do it. I’m proof of that. Check out the video below and the recipe in the video description to find out how to make your own Watermelon Rice Krispie Treats. And, yes, those seeds are chocolate chips which means, perhaps for the first time ever, you might want extra “seeds” in your watermelon. UP NEXT: Our April Prize! If I make a pan of rice krispy treats I end up eating piece after piece. I always add extra marshmallows. It’s one of the easiest treats to make!